At Yoast, we see a lot of websites on a daily basis. One thing we often notice when looking at these websites is how poorly the website’s or page’s goal is communicated. A great and fast way to convey your goal is by using headlines and taglines. Here, we’ll show you how to use headlines and taglines to your advantage. They need to communicate a clear message that people will understand. Because you want people to understand what your website or page is about, right? What are headlines and taglines? So the headline is a page’s or post’s title. And as Wikipedia so eloquently states it; that title should indicate what that page or post is about. In entertainment, a tagline (or tag line) is a small amount of text which serves to clarify a thought for, or designed with a form of, dramatic effect. [It’s a] variant of a branding slogan. I don’t completely agree with a tagline being for dramatic effect at all times, although I believe it could be like that in entertainment :) I do agree with the statement that a tagline serves to clarify a thought. Usually, it serves to clarify or specify the headline. A tagline is also something that’s not as mandatory as the headline. A page has to have a headline, but it doesn’t need to have a tagline. Especially not if the headline is clear enough in itself. Why use headlines and taglines? As we mentioned above, headlines and taglines are a good and fast way to tell people what your website is about. And this matters, because people want to understand what your website is about, so they know if you have what they want. People don’t want to spend 30 minutes (or 5, for that matter) searching your website to see if you do. They’ll just go to a website with a clearer message. Additionally, having to think about a decent headline and/or tagline for your website and its pages, forces you to think about your core business. What is it that you’re trying to convey? If a page’s headline is getting too complicated, it might be a good idea to consider making multiple pages for what you’re trying to do, for instance. We want clarity. It’s the experience we get when visiting that website for the very first time: do we get the website? Is it clear what the benefits are for us visitors? And where or how can I get these benefits? Don’t think that people will understand what you’re talking about, just because they’re on your site. Try to put yourself in the shoes of a person visiting your website for the first time. Is it clear what you’re offering by just reading the headline and tagline? For this post, the headline is “About headlines and taglines.” That’s simple, short and clear. People will know just by reading that headline what the post will be about. Of course, for a single post, it’s much easier to distill what it’s about than for your entire website or business. So you should take some time to formulate your core business and goals. If you think you found a decent headline, it’s a good idea to have someone outside of your business check it out and let them tell you if they understand. And if that’s not the case, continue until they do understand. If possible, try to write your headlines in an action-oriented way. You can do this by using verbs and sentences that imply an action for the visitor. 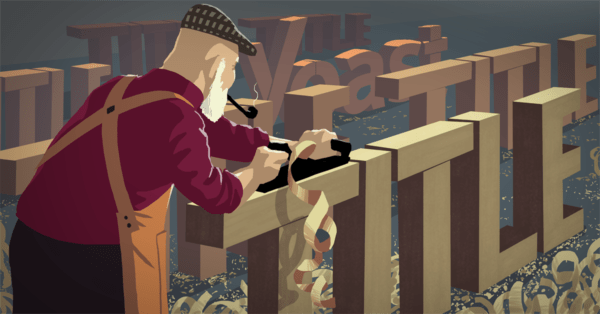 For instance, we could have a headline saying: “Optimize your site with the Yoast SEO Premium plugin!”. This shows people one of the core values of the plugin, and making it active will motivate a lot more people to try it. Combining your headline with a tagline will give people a concise and clear explanation of your headline. Not all headlines need one per se, but usually, the effect of having a tagline (or sub-headline, whatever you want to call it) is a positive one. The tagline is another chance to intrigue your visitors, and to clarify something for them. This is probably the hardest to do, because how do you know what is clear to people? This is something you should test. But in any case, you need to make sure your headline is as specific and concrete as you can make it. Again, it all comes down to clarity. By now you must get the main point: you have to be clear! If people can’t understand your website or don’t get what you’re selling/offering, they won’t stick around to figure it out. Especially when people are looking for something, they will only scan the page they land on. So make sure that what they’re scanning delivers its message as clear and concise as possible. What do you think? Have you discovered some nice headline variations that worked out well for you? Or have anything else to add? Let us know in the comments! Helpful article for myself, Michiel, as I look at my own website and makes me question if the headlines/taglines I have done make things stand out enough at first glance. Thanks.